For the first time writing this blog, I'm at a loss for words. But writing about Sylvia, and now about Lena, is more difficult. Maybe it's that my own babies... what is it? The mind-trip that I have babies, when I still consider myself 14 years old? That they're so particularly and uniquely these babies, not someone else's generic babies? That they're not me, so it feels presumptuous? I think it's that Sylvia and Lena both have a bit of mystery attached to them, a mystery I don't necessarily want to solve or pick over. Who these kids are is being revealed to me, slowly and inconsistently, and that's how it should be, right? Or maybe it's just the sleep-deprivation. In the days before Lena's birth, I was worried that there was a psycho-emotional dimension to how long she was cocooning herself inside of me. Was it because I hadn't focused enough on her, and she was biding her time, waiting for me to pay attention? When pregnant with Sylvia, I had a rich fantasy life about who Sylvia was, and what it would be like to be her mother. I imagined all sorts of romantic details--the love that would immediately flow from me to her and back to me, and how she was destined for greatness, if only on an interpersonal level. But with this one? Not so much. First of all, we didn't have an agreed-upon name for her until she was born. (Aron even had second thoughts a good 24 hours after we'd sent out the announcement email.) Second, despite numerous ultrasounds, we hadn't once gotten a good look at her face. And then there were all of the lessons I'd learned from my experience with Sylvia: a shining moment of disbelief and wonder at holding her beautiful self in the flesh, a recognition of who she was on the outside feeling similar to how she felt on the inside. 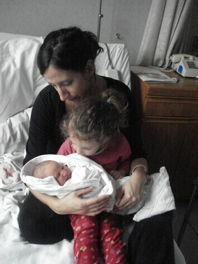 So when Lena was born, momentarily nameless and without my Advanced Projection, I didn't know what to expect, because... I hadn't really been expecting anything I could wrap my mind around. And instead of the big blank or void of emotion I worried I'd feel, I fell head over heels for her, immediately and without looking back. Her nose was smushed into her face; for the first couple of days, she had an unsightly rash on her face and her chest; her skin was peeling over much of her body, because as a late baby, she didn't come covered with the waxy protective vernix that Sylvia had. The expression on her face could at best be called Extreme Grouchiness. But Aron and I, grinning like fools, laughed about it all, admitting to each other immediately that yes, we saw all of those flaws, and no, we could not care less. Aron spent that night at home to ease Sylvia's transition, and I spent the night holding and gazing at and smelling Lena. I was finally meeting her, without the interference of my preconceived notions--and I couldn't get enough. I still can't. It isn't all gorgeous (the other day, I changed three of her diapers and entire outfits in a row, without her leaving the changing table once). Sometimes she cries for long stretches (but it's almost always gas). And it's hard to say that I know Lena very well yet, since it's only been two weeks, and for 80 percent of the time, she's been asleep. But we're getting wonderfully acquainted. We mostly hang out in bed, nursing, watching tv shows online, and making faces at each other. Sometimes we go on limited adventures. She smiled at me--twice!--the other day. She recognizes my voice. And she's kind to us, sleeping at longer and longer stretches at night. Next time, I'll get into what has been trying about these last couple of weeks (hint: a certain beloved preschooler who lives at our address). But overall, the Lena experience has been a surprising delight. Why didn't I think of not-thinking before? Join writer Emily Bloch each week as she chronicles her pregnancy--and now, life with a new baby.